“I saw the future of rock and roll and its name is Bruce Springsteen.” As great as Bruce Springsteen became, he never really lived up to his manager’s hype about his future. A couple of weeks ago, I was reminded of this while listening to one of the Boss’ songs and eating an example of the future of cheeseburgers. If that last statement ends up just as embarrassing, I wouldn’t be surprised. Still, if nothing else, this way of presenting a cheeseburger should be the way restaurants prepare their cheeseburgers. 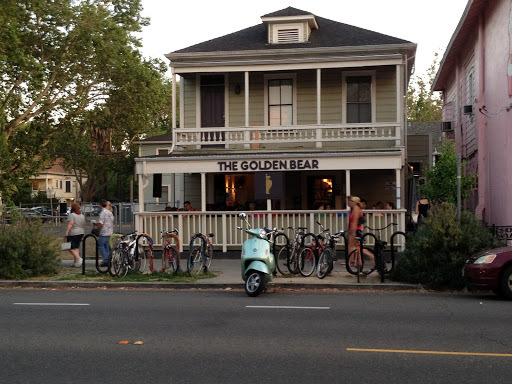 The burger is called the Juicy Lucy and the place that serves it is the Golden Bear [http://www.goldenbear916.com/]. 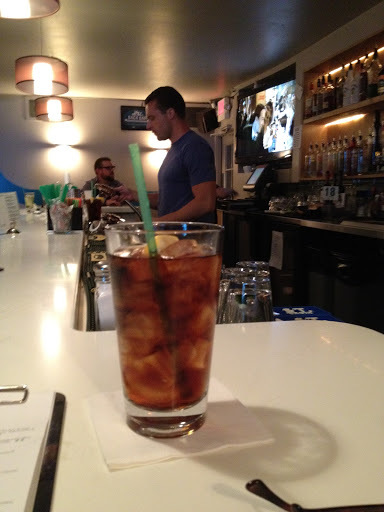 It is a midtown Sacramento watering hole with a staff and clientele of primarily 30-something beer connoisseurs. My youngest son calls it the “Golden Bro” because the staff and many of the male customers like to call each other “bro.” I noticed this when I visited the place. The Juicy Lucy, a sight and taste to behold. When I bellied up to the bar and ordered the Juicy Lucy, the only burger on the sparse menu, I ordered it medium-well for the second time in the last three burger scoots. 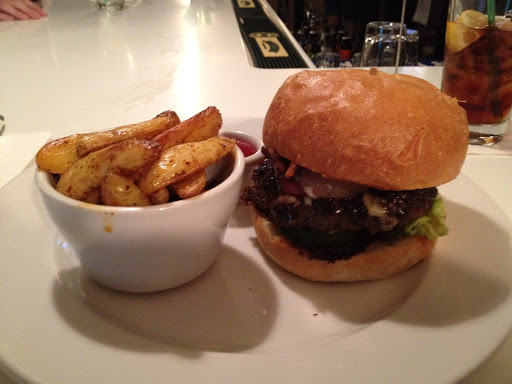 I ordered the Flaming Cafe burger at medium at the server’s insistence, and it was great. Therefore, I may have been wrong all this time, like my mother has suggested. When the person I presumed to be the chef brought the burger to me, he was dressed in immaculate chef’s whites and a toque, and the Juicy Lucy was presented on a white plate with fries and ketchup, both in white ramekins to keep the elements separated. The chef held up the plated at ear level, fingertips almost fully extended under the plate, while all around him people in tee-shirts and shorts enjoyed beer while watching the San Francisco Giants on a widescreen TV mounted over the bar. When the chef gingerly placed the dish in front of me, announcing “Juicy Lucy” as if he was saying “foie gras, Monsieur,” I noticed what had to be the perfect model of a burger posing as a still life. The burger was fully assembled, not open-faced waiting for a picky eater to pluck out the onions or dump a bottle of ketchup on it. The Lola Rosa lettuce was trimmed so its edges did not fall over the patty and lower half of the bun, as lettuce does with most burgers. Someone put this burger together thinking that it was not just a burger but also a work of art. There, I said it. Nice, but $3 is hard to swallow! I almost did not want to eat the burger. I began with the fries, as biting into the Juicy Lucy at that moment seemed sacrilegious. When I finally took a bite, the burger’s taste matched its beauty on the plate. The half-pound of Niman Ranch beef stuffed with Jack cheese was the best I had ever tasted. All of the elements exploded on my taste buds, dimming the baseball game, the beer orders, and the “hey bro’s.” The joint could have been going up in flames and I would not have noticed. I was in a different place and not just from the perfect match of cheese and beef; the other elements worked superbly with the burger: the bacon and Belton cheddar crumbles added to the great smoky taste, the freshness of the Lola Rosa lettuce complimented the pickles, and of course the perfect amount of grilled onions and aioli on the locally baked Bella Bru Café bun. This is a good time to point out the obvious: the Golden Bear did not invent the cheese-stuffed burger. I’ve had them before, but almost exclusively at someone’s house. Whether the beef is high grade and fresh or not-so-high grade and maybe even frozen, most places order their patties pre-made, making stuffing them with anything, including onion, diced mushrooms, garlic, or jalapeños out of the question—and too expensive. This kind of a cheeseburger is not the future of cheeseburgers for places like Whitey’s, Scott’s Burger Shack, and Cookie’s, and that’s okay. This kind of cheeseburger is for any place that does not mind setting up its kitchen to accommodate the creation of gourmet, hand-crafted burgers. Not too many places exist to do this, but for the establishments that can, I must ask why they do not stuffing their patties with cheese and other items rather than dropping them on top of the burger? This burger is the Bruce Springsteen of cheeseburgers! Yes, I know that I am gushing. What can I say; the Boss is my hero. To use a square song to bring home my point about this burger, “if there’s a rock and roll heaven, Bruce will be at the right hand of Elvis enjoying the King’s heavenly donuts!” I do recall that the King enjoyed cheeseburgers as much as donuts, and the Juicy Lucy is truly a burger made for the gods, bro! I give money to a few charitable groups: Union Gospel Mission, Sacramento Food Bank & Family Services, and Safe Ground, to name a few. As a scooterist, I find one charitable organization interesting. The Jedi Knights Scooter Club [http://www.jkscnyc.org/], with nine chapters across the U.S., set up Scooter Relief [http://scooter-relief.org/], a relief fund initially for victims of Hurricane Katrina. In the last seven or so years, the fund has responded to scooterists who have been in accidents or are facing illnesses. May the force be with you, Jedi scooterist!